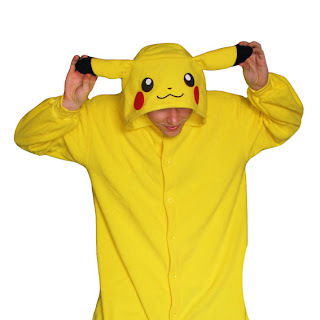 Animal Costumes Blog: Pikachu Kigurumi added! Ladies and gentlemen, we are very pleased indeed to announce an extra super special animal costume, the newest to join our gang. No, your eyes do not deceive you, it is indeed Pikachu of the Pokemon franchise. In case the Pokemon thing passed you by (where have you been?) the phenomenon began life as a Gameboy game in the 90s. The idea was to collect special creatures with special powers (the "Pokemon") and use them to do battle against your friends or enemies. Picture bear baiting in another dimension, but way less uncool, and you're almost there. Anyway the thing spread like wildfire, quickly becoming a hit kids' TV show and even quicklier being adopted in the West. And it was Pikachu, the little yellow fella with the rosy cheeks, that was always numero uno. Despite the fact that he was so, shall we say, vertically challenged. It makes us very happy to bring this adult-sized Pikachu kigurumi costume to you, our customers. The costume is yellow, nostalgic and comes with an electrifying lightning bolt-tail. These are the three most important factors in any garment, I'm sure you will agree.